Description: Level: Integrated product, process designers and managers, digital design and manufacturing engineers, industrial engineers, manufacturing and assembly system design engineers, quality control engineers, and maintenance system design engineers. Ideal for undergraduate / graduate education and research in product / process design, design for manufacturing, assembly, quality, disassembly, concurrent engineering, product lifecycle management, CAD / CAM, industrial engineering, manufacturing technology, and others. Several sections and cases could be used even for high school students and technicians focusing on product design, technology and maintenance. Industrial Sponsors/ Contributors include with special thanks to IBM, Delmia, Dassault Systemes, USA, Panasonic, USA & Japan, Richard G. Ranky BS(Hons), NJIT, MS, and PhD student at Northeastern University, Boston, for his work on various digital design simulations and for being the major contributing author of Chapters on CAD, CAM and PTC's Windchill in the 3D eBook. Also special thanks to the publishers, CIMware Ltd. UK, CIMware USA, Inc., and others. Contents: This is a novel DVD duo package. 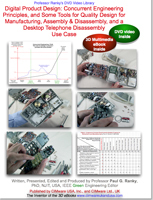 In the first DVD, on video, Professor Ranky introduces the basic concepts of Concurrent Engineering, and illustrates several fundamental product / process design, design for quality, assembly /disassembly, and other design rules with simple and practical examples whilst disassembling a desktop telephone on screen. In particular, the rules and principles discussed with examples include: design for quality, maintenance, assembly, disassembly, eco-friendly design issues, cost, risk, the concept of designing components, modules, and systems that can be assembled, as well as disassembled, material selection issues, design for the environment, the principle of 'z' stacking for assembly / disassembly, modular design principles, some part handling, and feeding issues, automated assembly and disassembly challenges, and others. The second DVD in this duo pack is a comprehensive web browser readable, interactive multimedia 3D eBook. Equivalent to over 600 pages of text, with interactive images, 3D objects, video clips and several active spreadsheets to calculate with, covering in 19 chapters all important aspects of Concurrent Engineering and PLM (Product Lifecycle Management) in depth. System Requirements: the video DVD-ROM: NTSC standard definition (SD) DVD video player for TV, or computer. Approximate length 38 mins, in 16:9 widescreen format, also playable on a 4:3 regular screen, or any good computer screen (800 x 600 resolution, or better). Also available in PAL DVD video, in streamed digital, and Apple Video iPod formats for mobile devices. The high-definition NTSC and PAL formats are also available. The 3D eBook DVD-ROM runs on a computer with a web-browser, a spreadsheet program, and QuickTime ver. 7 or later available FREE from the web. (Related publications can be found at http://www.cimwareukandusa.com).